Are you searching for a way to store lots of stuffed animals or other bulky toys in your child's room? If so, you may just want to consider a pop up organizer. There are lots of varieties and brands available, although I personally like the one featured. I actually have a couple of these in my kids' rooms, to hold bulky but not too heavy toys. For example, in one room I use them for stuffed animal storage (not in the same room I have used the stuffed animal net) and in another room I use one to hold balls, such as soccer balls for practice, but also just bouncy balls the kids play with around the house. Pop up hampers can, of course, be used for dirty clothes too, if you want, but I find their toy storage potential to be much greater. They are light weight, so you can move them around easily, and then collapse for easy storage when not in use. They are also easy for your kids to reach into, to choose their own toys, without having to ask you for help to get something. 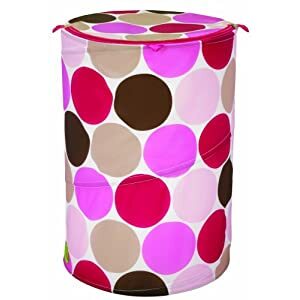 The wide mouths on the hamper also make it easy for kids to refill them back when they need to clean up their rooms too. You can see even more toy organizer and storage product recommendations and ideas. Shop safe at Amazon and enjoy free shipping if you spend $35 or more on most items. Thanks for visiting Household Management 101's Organizer Store, your one stop shop to help you organize and find storage solutions for every area of your home. Keep exploring for even more great ideas and cool products that can help you get, and stay organized today. Join in and write your own page! It's easy to do. How? Simply click here to return to toy organizer.